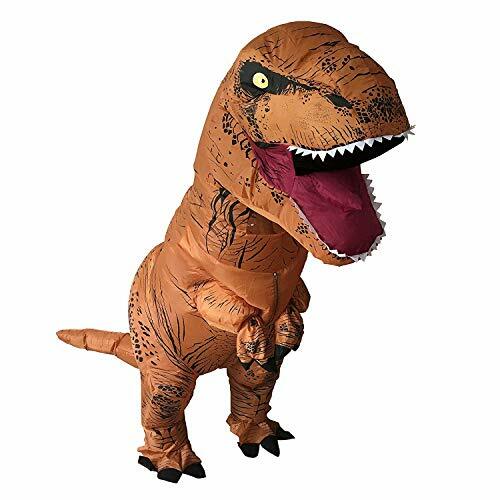 HEYMA T-Rex Costume Inflatable Dinosaur Costume for Adult Halloween Inflatable Costume | What Should I Say? Remember T-Rex in remote antiquity? They are horrible existence for other creatures in old time. And now, they come back in a cute image and this is our adult inflatable T-Rex costume. Have never seen T-Rex can be adorable right? Try this, cute image and ferocious impression merge in one suit, this T-Rex costume can be your new darling, especially for cosplay party, Halloween, and various festivals. Wear on it and enjoy your new cosplay time! Fast inflating with air pump, powered by 4 * 1.5V AA battery(not included). Visible, water-proof polyester, wipe clean surface and hand washable. Perfect to use at: Halloween/Xmas celebration, party, bar, park, fancy dress, carnival, cosplay party etc. Size and Battery Require: One size for fits men and women from 5'3 to 6'5 (160 cm-195 cm). Requires 4AA batteries, which are not included. Easy to wear on and take off : Step into the costume, do the zip up, Tighten the drawstrings as much as possible .switch the fan on, wait a minute and you're ready to go. High quality T-Rex costume: our high quality material means re-enforced stitching at stress points to make sure this inflatable costume lasts more than one wear. If you have any questions about this product by HEYMA, contact us by completing and submitting the form below. If you are looking for a specif part number, please include it with your message.